I recently transformed a small bedroom into a home office, sitting room and spare guest room. The process required very little ingenuity, it all boiled down to finding the right items. Many of which I already owned. However, since the room is meant to perform triple duty it was essential that I find the right seating. Dorel Home Products, aka DHP, has the best selection of futons, day beds and other functional furniture at extremely competitive prices. There were quite a few pieces from DHP that I really liked, so choosing was a bit challenging, but a lot of fun. 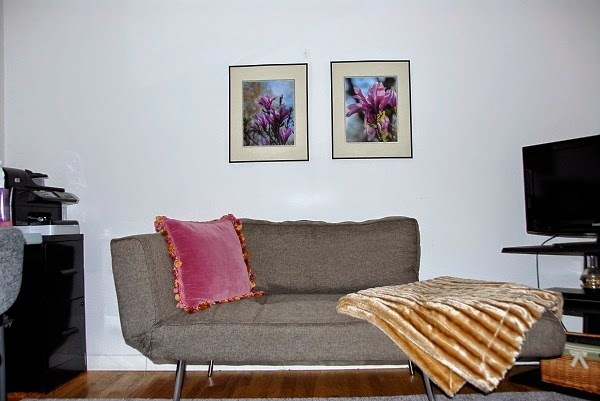 I went with the very versatile Euro Futon which works perfectly for the small space. I absolutely love this futon! As you can see from the image above, the arm rests fold at different angles. This is not only great for creating extra seating and sleeping, it's also ideal for comfort in that I'm able to position the arm rest at the right angle if I'm watching TV or reading. Thus, it can also functions as a chaise lounger, the back cushion can be removed to create that look. Talk about versatility. The futon is offered in either black or grey. I opted for the grey and it's actually more like a taupe. It has both elements of grey and brown, so you can opt to bring out the grey or a warmer hue. Assembly was easy. Just add the legs and the back bar. Everything I needed; the legs, back bar and tools, were contained in the futon with a velcro enclosure. It's what I would call firm comfort. I'm an average size female and I sit, lay and nap on this all the time and I'm perfectly comfortable. With that said, it's not designed for permanent sleeping. For a guest it's serves its purpose wonderfully. It sits three average size adults comfortably. The weight limit is four hundred pounds. I can see this futon working in so many different settings. such as extra seating in a master bedroom, kids' room, family room, etc. This piece enabled me to turn a small room into a very functional home office, sitting room and guest room. The futon is so unobtrusive, it's as if it were designed specifically for a small space. It's light and airy and really makes the small space appear larger. I have been looking into buying a Futon. I must say I like this ones style. I love how you just lay the sides down if you want to. I don't know where I would put this but it would make a fabulous gift! We'd love a futon in our home office. It's handy for overnight guests. oh this is perfect for our townhome. We need an extra sleep space and don't have much room. Really love it! I really love the selection of products they offer on there site, great home décor pieces and very affordable prices when your on a budget. I love the looks of the futon. It doesn't look like your typical futon that is made for "college students". It's too bad that this isn't more grey, I'd love it even more. Futons are so versatile. We have a giant sleeper sofa in our office/guest room. A futon would have been a much sleeker choice. I love futons, there handy in guest rooms. I love the style of this Euro Futon! It's different and very nice. I think this futon looks stylish. I would keep it in my computer room for when we have guests. This futon looks so cool! I love how versatile it is. I love the look of this futon. Very modern! This futon would be great for a reading area! This futon would be perfect for us. I love the look and how neat it is. this futon seems like it would be great for when guests stay over! I would like this for my apartment next year. this is fantastic! i love that you can use it for multiple things. I often have people staying over, so that would be great too. What a great piece of furniture. 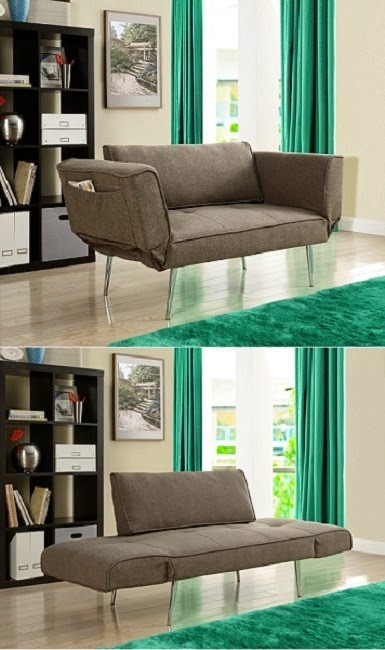 I love that it plays the part of a couch, and the arms can fold down too for a lounger/bed. Really cute. I have been looking for new furniture to fill my living room! I love the style of the futon! would love to get it for my upstair craft room- be great place to read and sew and have for overnight guests! Love how versatile it is! Would go great in my living room! I have a small place. I like double duty type furniture. This piece is a winner! I could definitely use this. Thanks for such a great giveaway! Wow, I'd love to have this! I like how you can put the sides down. I have huge, old furniture pieces and hope to replace them all eventually with something sleek, smaller yet still functional and comfy. I love the look of it, it is definitely European in look. I really like the futon as a versatile piece for living or bedrooms. I can think of a couple of places in my home where this futon could be used. Nice description. I've always thought futons were the coolest--but this one definitely tops the candy-colored ones I begged my parents for when I was a teenager. This would be a perfect addition to our living room. Since we made our guest room into a child's room for our grandson, having a futon for guests would be great. This looks pretty stylish. Something to consider for our home. I like this..so versatile! I think this would be perfect in our home office. I also wonder- just how soft is it? I have known futons to be SO hard... "cotton" stuffed.. you may as well sit on a hard chair as those. Sleep on it? never ever. A futon made with foam cushions.. now that would be the ticket. I could use a thing like this in my room, I retreat there to watch TV sometimes, get away from the endless sports the hubby watches. I've been looking for a solution for our small office/craft room/guest room. This futon would fit perfectly. I like its neutral color. My daughter would love this! She's a college student & will be getting her 1st apartment this fall. I just moved to LA and my boyfriend and I have no furniture for our little itty bitty studio and this is the perfect size! This would be great in my guest room. I love that this futon has sides! That would be great for reading or relaxing! We have been considering a futon for our spare bedroom/office and this one would be perfect! The color matches the theme of the room and it looks quite comfy! Absolutely Love this for when i have company come, which Is too often! This is a nice futon. This is like an updated version of the chaise lounge type couches they used to have in old movies...i LOVED them, always wanted one. I'd keep one arm down for that same look. Futons are the best they tend to be very comfy. I would love to have this for our spare room. It is so much nicer than the old type of futon. I need a futon for my guest room. This would be perfect for when we have company over! I really like this Futon and would put it in our den. We need more seating in there and this looks really comfy. Striking, modern, functional and most importantly to me, it doesn't take up too much space like my current futon. We really need something like this for our house!! Always needing extra room for guests!! This would be great for our game room! Our old one is about ready to be tossed. Futons are the PERFECT gift for College Kids -- doesn't take up a lot of room and serves a dual purpose: sofa or extra bed! Love this futon for the office and guest room area. This would be perfect for Hubz' home office! It is basically an empty room with a desk, desk chair, and dresser. It really needs a great sitting space. I think the Dorel products are great. A Futon in grey is functional and could go just about anywhere. The price is right too. This would add so much class and comfort to my living room. Gorgeous! futons come in handy for guests. The article on the area rugs is dead on! You can change the look and feel of any area in the house by just buying or switching a rug! It is inexpensive and effective! Love the easy look of this furniture! I would much rather have a futon than have an air mattress that i have to store. Wow....that is one stylish, classic futon. I would love to have that in my living room....great piece. I love the way the sides can go down, and the magazine storage area is a big plus as well. My daughter would love this for her room, I can see her using it with one side down and lounging on it while playing video games, watching TV or reading magazines. This would add much needed seating to our living room. And I love how versatile it is. I like the looks of this futon/sofa. It has a great retro vibe. The chaise option is the selling point for me, I can already visualize me basking in the sun, flipping through a magazine with my feet up on the chaise loving life! This futon would be lovely in our playroom! We often have our college-aged nephew visit, so he could also use it as a guest room. We have been shopping for a futon for our game room. I love the style and design options. Got to forward this to my husband. I love the look of this chair. It don't look like it takes up much space which is great. Have been thinking of adding a futon to our home. Love the pockets. This would be way less mess making prone than the pillow covered couch my kids use now. This Euro Futon is awesome and would be perfect for my 2nd bedroom to serve as a couch/sofa as well as sleeping for company. This would be so cool for our camp! I love this style chair! It's different! This futon looks awesome. I love furniture that has more than one use and purpose. I'm hoping to move soon and have no furniture so this would be amazing. I love this futon, it is a neutral color and would be a great place for a guest to sleep. I love that the sides fold up and down and especially love the chaise feature. This is such a cute classy futon. It would look so cute right by a window in the corner of my living room. This looks like a great futon that would go great in my spare room, that I'm getting ready to take the bed out of to make into a school room for my daughter! Would go great in my new place! I love how stylish and classt this futon looks! It seems really versatile, too! I would love to nap on it. I loooooooooooove this futon! Seriously so much nicer than the standard futon. my kids would like this for when they have friends over. I have been looking for a futon and I really like this one! I love that couch. So functional! Bookmarking this page as I will be in the market for a new couch soon. I like how unique this futon looks. This would be perfect for out little guest room. I like the versatility of this futon! That look so cool! I think this would be perfect for the narrow space I have in my apartment living room. I'm a quilter and I see this quilt with a beautiful quilt thrown across it! I like the versatile style of this futon. I could see it in my den or one of my kids rooms. i absolutely love the pocket that can hold magazines, books, etc. i also love the versatility of the futon. what a well-thought up design and concept. A futon like this would be perfect for my home office/craft room. I have a daybed in there now but it takes up too much room. I really like the style of this futon. It would make a great edition to our living room or school room. The added magazine storage is a great perk! I love how functional this futon is. It would work great in my teenage son's room. I always had a futon in my twenties but havent had one in the last 8 years...I really love the look of this one! I could see it going well in my family room. I have a little library/office in a spare bedroom, and it really needs some comfortable seating for reading and watching TV. I lvoe this idea! I love modern furniture and and I like the color. That color would match perfectly. Love how versatile this is. I was thinking it would work beautifully in my office area as a couch/bed for company. Love it! this is such a great design! weve been needing a couch since we moved and this would fit the bill! This futon would be perfect in my tiny house! I know exactly where I would put it! We have been looking for a futon for our playroom/guest room. This would fit perfectly in the room! We have been looking for a futon to go in our playroom/guest room. This one would fit perfectly! This is a very stylish futon :) Perfect for my family room ! I live in a one bedroom house and having furniture like this that can be used in many different ways is key to living comfortably. This would look great in my home! I could so use this futon in our basement! It would be perfect!! Thanks for sharing! We just built a new loft space as an office/guest room and this would be the perfect piece! We just got a new home and are hoping for visitors! I love how comfy this futon looks!! I like the versatile arrangement available for this futon. It will also come in handy for guests. I have never owned a Futon before but would love one now! What a wonderful futon to use as a sofa or to sleep on over night . I like the style and fabric they used on it nice and neutral for any decor. I would love to have a Futon! I have such a small living room, this would fit in perfectly and open up some more sitting space! Wow what a beautiful and unique piece of furniture.this will be perfect for my son and daughter in laws new home.then something for me.thanks for sharing. This futon looks way better than most. i wonder if it comes in different colors? 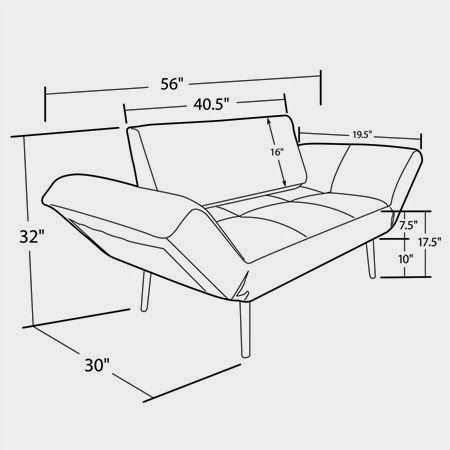 This futon would work wonderfully for our front porch! We have n enclosed front porch that we really enjoy during the spring summer and fall. This would be great to realx on, read, or in my husbands case, take a cat nap! This is a beauty and just perfect for us it is just the right size! I love the vintage look! I love the retro looking style furniture. This would be wonderful in my home! Futons are my favorite! I used to sleep on one all the time like a couch, it made me feel at home. This is so stylish! I love how versatile it is. I am up for a low income apartment (my first apartment ever) and I would love to win this for my living room. I love the look of the Futon. It is very stylish piece of furniture that doesn't even look like a futon matching my décor. I love the magazine pocket on the side!! I love the style of this Euro Futon.My mom really likes this. This futon is stylish and practical. My cousin is moving into his own apartment soon. I bet a futon would be the perfect solution for his living area. We could really use something like this in our gameroom! We just moved to a new house and have not yet filled it with furniture! I like the versatility of this futon. It would be perfect for my living room. I live in a very small apartment so the futon would help alot. This would be a great gift for my oldest who will be moving out in the summer. We could use this in our home school room for those days when one of the kids is feeling ill. I love this futon! I use to have the old ones when I was a teenager and I hate it! I LOVE the way this one looks and has storage!! I love futons they are very versatile. I would love to be able to give this to my son in college. It would be so great for him. I love that this futon would work in a small space! What a great idea! I have never seen a chair like this and it would be so perfect in our spare room as we do not have anything in it yet. I am so in love! This would be a great futon for my Very small apartment-cute and smart! As a writer, I spend a lot of time in my home office and Futon like this one would be so perfect. Often I just need to lie down and either take a little nap or relax and think. And it's nice to get away from my desk and computer screen ~ I like to read off of actual PAPER in a relaxing position. A regular couch wouldn't fit nor look appropos with the rest of the room. Thanks for the the review. I am definitely going to look into this. We have purchased many futons over the years. This is much more functional than the ones we've had. This looks way better than what you think of a futon. Love the style! I think this would work well in a game room, and to be used for any extra bed occasionally. This futon looks stylish and functional! I know just the room I would put this in! It's gorgeous! I've always wanted a futon. My neighbors had one in college and it was surprisingly comfortable. We are in the process of redoing a room in the basement for our teenage son. I think he would like to have a futon in his room. We just finished our basement, and our daughter is moving downstairs. I'd love to add a futon to her room for when she has sleepovers with friends! It would be perfect! Sure could use this looking for something you can sit on and when I have over night guest can sleep on it to . I love that this futon is so versatile. So many different ways to use it/set it up. This futon looks comfortable and I like all the options to convert it how I would like if I change my mind and won't it to function a different way. It appears to be made well with great structure and fabric. Futons are an inexpensive way to spruce up a small space without making it look cheap. My husband and I are looking for a new home, most in our price range are unfurnished, however. We could use a Futon like this one. This would be perfect to replace our much-used love seat. I love the various ways you can use it. This futon looks so comfy and modern! I love it! Thank you for having your blog. You offer a lot of great information. I can't wait to move so I have an office to set up like this! As we already have some other furniture and pillows etc to accessorize in grey, the grey futon would be perfect. Even my picky husband said it looked cool. Very nice choice! I really like the arm rests are adjustable! This futon would look great in my family room. This would go great in my room! Oh wow! That's such a cool futon! Love how adjustable it is! I love the look and style of this!! It would look great in my front room or even my husband's office! This is awesome! Perfect for when a friend needs to crash on your couch! I love futons they are so versatile. They make great seating during the day and great beds at night. I like that the futon is cozy, functional but still stylish. This will be great in our small space. Thanks!